November brings both turnover and tradition. Out with Halloween, out with the fall leaves and warm air, in with the chill, snowflakes, and turkey-day festivities. A lot more than the usual "coming and going" of the season has happened to me this past month. My best friend left the company I work for, I took the lead on hiring a new community team member. I've sparked new friendships, the flames with old crushes sputtered out. Drama rages on in various realms of my life, and it's left me questioning who I am. The winds of change are swirling and I've reached an inflection point in my life. I'm doing a lot of reflecting, a lot of raging, and a lot of hustling. 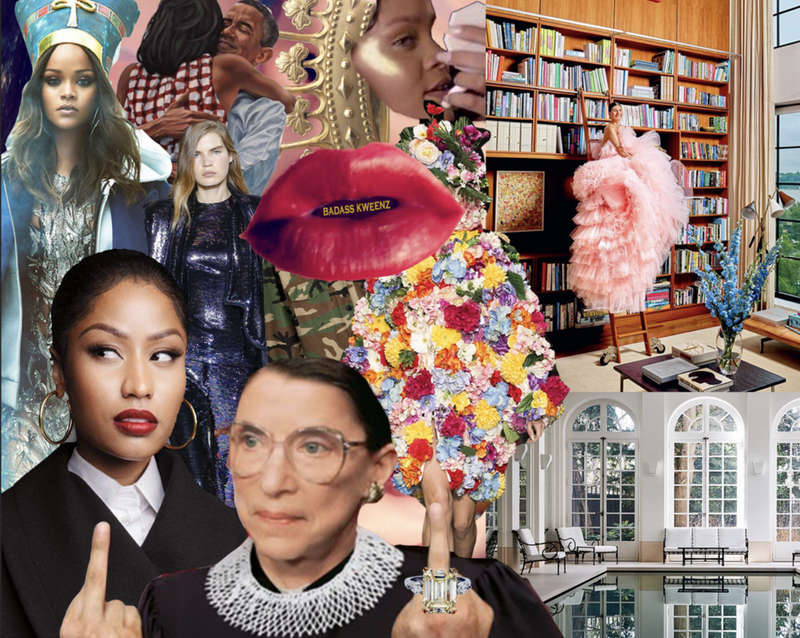 The bold colors, reflective textures, and inspirational women featured in this month's mood board are symbolic of the creativity and power I'm seeking to evoke as I charge forward. Rihanna as Nefertiti: RiRi's cover shoot for Vogue Arabia has given me ALL the feels. Every single detail gives me a new layer of thrill, pun intended, as the use of layers is one of the things that thrilled me in the styling for this shoot. The way the dress, hoodie, and jacket so seamlessly play together with clashing is in part facilitated by the expert use of color (my favorite hues of blue in the outer layers), both in the styling of the outfit, but also the makeup, in my opinion. The choice to style her as Nefertiti also evoked some serious nostalgia for me, due to my fascination with / study of Ancient Egyptian history and fashion when I was younger (first grade; I was a major nerd). The complete look is so completely regal but also so feminine and radiant, it's the vibe I want to channel all day every day. flower dress: While perusing a Vogue article about the trends spotted on the 2018 runways, I saw, and promptly fell in love with, this vivacious garden of a dress. It had everything I love most: drama, color, dynamic shapes, coordinating accessories! Then, shortly after encountering this dress, I read a quote by John Ruskin, "The purest and most thoughtful minds are those which love color the most." Obviously, this validated me to an outlandish degree, and I proceeded to tweet about it. library: This dress / shoot is by Giambattista Valli and it's EVERYTHING I want for a modern day interpretation of Belle, and also my life. This library is the stuff of my DREAMS-- it literally has everything-- bookshelves you need ladders for! floor to ceiling windows! colorful artwork! giant bouquets of flowers! lounging chaises for reading! Then there is that dress. OH, THAT DRESS. A millennial pink confection of tulle straight out of my dreams. Ever since Oscar de la Renta walked giant layered gowns down the runway back in 2012, I've been obsessed with this look, and then Giambattista Valli went and UPPED THE ANTE. I love the "drowning in a dress" look, but the right woman still "wears the dress" (vs "it wearing her") and in my mind, I'm totally the former. Or at least that's what I'm channeling as I pretend that it's me lounging on that library ladder. pool: Something about this pool, these windows, stirred something in me. I can't place my finger on if it's longing or nostalgia or just "wow that's beautiful". Part of me yearns to dive into that still, still water and just swim all day. The peace and calm that swimming brings me internally would be a welcome reprieve from my recent mental turmoil. Nicki Minaj (channeling RBG): The instant I saw this photo I was SHOOK. Something deep inside of me was moved. Nicki has always been one of the kweenz of my heart, but to see her styled in a sleek black coat with strong white collar and THAT SIDE EYE gave me instant RBG vibes and my mind nearly melted. It was a new side of her that I hadn't seen, but I am so here for. It gives me hope and belief that I, too, could have this chameleon-like ability to change my look, should I want to re-invent myself. It also reminded me of our shared innate power that the right ~lewk~ can totally bring out, and show the rest of the world a glimpse of. RBG (flipping the double bird): This is a real photo. This is not some Photoshop job. I discovered this AMAZING TREASURE while searching for a photo of RBG for another project (yay powerful ladies!) and stumbled upon this. She is just this badass. Fun fact that I recently learned: she also has a daily exercise routine that involves planks and single leg squats. NOTORIOUS RBG GONNA OUTLIVE US ALL. She is my always inspo, but also, I would like to age just like this: getting sassier and stronger every day. ring (on RBG): This is my DREAM RING. Yellow diamond, 7+ carats, emerald cut, on a platinum band. Personally, I'd remove the two white diamonds flanking the main stone as they only serve to distract. At one point, I had dreamt of this as an over-the-top engagement ring, but I have a better PLAN now: I'm gonna buy it for myself when I get my first C-suite job. Sitting in my corner office with this stunner on my finger, feet clad in Prada pumps. I can see it now. lips: These are actually my lips! Clad in a custom shade of red that I named "Maneater" (which my mother finds horrifying and suggestive). The text inside the lips reads "Badass Kweenz", a reference to a women's empowerment group I co-founded, and also a visual homage to grills (hip hop for life) and the phrase "on everyone's lips". Obamas: #goals. I miss them. Need I say more? sparkly suit: I have been LIVING for glitter. Sparkle. Reflective materials in general. A full suit, covered in sequins, in this amazing indigo hue is the power look I need and want to own. camo jacket: Mike predicted the camo trend before I did, but I quickly jumped aboard and was giddy to watch the fashion world walking camo down the runway and Jay-Z's SNL stage for his first performance transformed into a camouflage cube over the following months. I've continued to add more and more camouflage to my wardrobe and it's become one of my "power patterns" when I need to evoke strength and power in times of difficulty. crown: Recently I've been referring to people as "kweenz"/"queens" A LOT. I also co-founded a women's empowerment group named "Badass Kweenz". The crown has found it's way into my most recently / frequently used emojis. I figured it needed it's fair representation here, too. fenty beauty highlight: OH LAWDY. Fenty Beauty has revolutionized my highlight game. I started off with some "Hustla Baby" Killawatt highlighter and soon graduated to "Trophy Wife". I shine like a golden star / trophy nearly every day. When people ogle my facial sparkles, I grin and remark, "I do this so I can shine on the outside as much as I do on the inside". They usually don't reply. Also, Rihanna is absolutely en fuego lately. Anything I can do to evoke her radiant power, I'M DOIN IT. GLITTER. ALL DAY. EVERYDAY. FOREVER. background: The background of November's moodboard is actually a selfie I took while in San Francisco. I found out that Bite Beauty was opening a permanent Lip Lab collab in Pac Heights, so I texted Alex and we went and got bespoke lipsticks made! Of course, we also took ALL THE GD SELFIES. Aside from a glittery face, a bold lip is my other beauty statement / must-have. The warm fuzzy memories and joy derived from female friendship also needed to be included in this board. It's the greatest thing in the world.